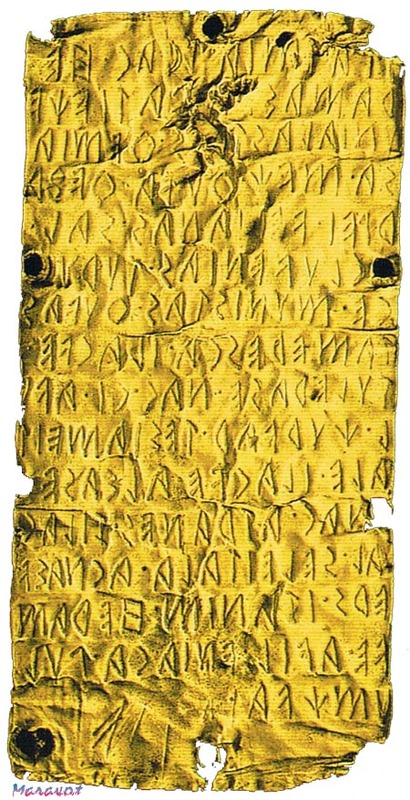 11.17.14 Translation of the Pyrgi gold tablet # 1, Etruscan Phrases showing Etruscan conjugation and declension patterns and vocabulary . a survey of Etruscan & Latin texts relating to the Pyrgi Gold Tablets document supplementing, "Work Notes on the Pyrgi Gold Tablets." Other works on "Etruscan Phrases" that have been updated via PDF files : Zagreb Mummy (see "Work Notes on the Zagreb Mummy." ), "Work Notes on the Tavola Cortonensis," "Work Notes on the Perugia Cippus," "Work Notes on the Magliano Disk" and "Work Notes on the Novilara Stele.” (PDF files), all of which are reconciled to one another. This latest change is based upon Etruscan GlossaryA.pdf developed from our Indo-European Table 1. After the series of Work Notes is completed, changes will be made to this page. Copyright © 1981-2014 Maravot. All rights reserved. Copyright © 1981-2014 Mel Copeland. All rights reserved.